Small gift/treat boxes are nice to have on hand, and they’re even better when they can be folded and stored flat until ready to use. This project ensemble includes a flat-fold box, a decorative floral adornment, and four note cards, complete with coordinating envelopes! 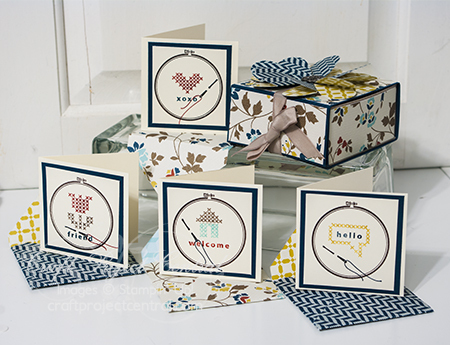 And using the cute Hoop La La stamp set, it makes a great gift for those that love cross stitch! This project is a quick, easy, and fun class project and also makes a great craft fair project to make and sell! This fabulous project was designed by Regina! If you have a chance please head on over to Craft Project Central and leave Regina a comment on her project! If you would like to subscribe to the September edition of Craft Project Central and get 10 wonderful tutorials for just $10 then click HERE!